In a cozy garret above a downtown Iowa City church, a group of people gathered to talk about the work they’re doing. Or would like to do. People returning to society after being released from prison attend skills-building workshops here or confer with mentors, or can attend a spiritual seekers group, as part of the Inside Out Re-entry Community. Though they’ve done their time, recently released “insiders” face tremendous challenges — a place to live, finding a job and, often, distrust in the community. Job applications may ask about felony convictions, making it difficult to land employment. Felons in Iowa are unable to vote. And some must take frequent and invasive drug tests. Inside Out offers leads on employment and on a place to live. And, perhaps most importantly, it offers a sense of direction. “It’s hard in the beginning,” Letisha Molina says. “You have to have patience. Well, in prison, you’re always standing in line, so you learn some patience,” she laughs. Molina had no idea about her credit score when released, for example. She got help with that and also her first job through Inside Out. She’s now working at the University of Iowa Hospitals and Clinics, a job with state benefits, something that was inconceivable to her on the inside. Director Mike Cervantes says the program is starting to work with more people before they’re released, helping get a re-entry plan established. The Department of Corrections has a program, but it stops at the gate. This helps bridge that gap. Returning citizens constantly jump through hoops, especially for housing. Public housing is hard to access, especially if you have a criminal background. And landlords in general can refuse to rent based on criminal background. Johnson County Housing Trust Fund has helped on this front, paying the deposit and first few months of rent for seven people so far. The dream, Cervantes says, is for Inside Out to someday have its own housing. Jay Santana, who’s been out for a few weeks, is staying at the new Catholic Worker House, while looking for employment. He points to the importance of honesty, noting that returning citizens need to have a conversation with landlords, be upfront about their past, and let the landlord make an informed decision. And during our conversation, an interesting moment occurs. Santana is talking about his expertise in online media management; Molina brightens — can you teach me computers? They connect. Dorothy Whiston, program founder, adds that there are many issues a person who’s been incarcerated for years faces — maybe not knowing how a cellphone works or starting a bank account. Or having low self-esteem. They’re expanding year to year, but do need stable funding — a fundraising committee has been set up. Needs also include mentors and transporters, furniture, and pots and pans. To help, call 338-7996. InsideOut Reentry Director Mike Cervantes appeared recently on the program Ethical Perspectives on the News, as part of the Restoring Voting Rights for Felons panel discussion. When Letisha Molina went looking for a new apartment, she was rejected 12 times. She had bad credit, she says, but there was another issue tripping up potential landlords: her criminal past. Molina has been to prison twice for using and selling drugs in Arizona. She used to use crack cocaine, but Oct. 11 will mark five years of sobriety. Two years ago, she moved to Iowa City looking for a fresh start. Mike Cervantes, director of the Iowa City-based Inside Out Reentry Program, which works with Molina, said finding a place to live is often the biggest hurdle for people who were formerly incarcerated. 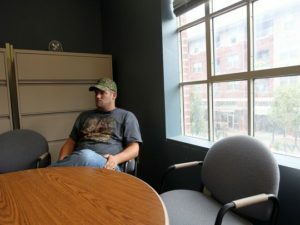 “In Iowa City it’s so difficult to get an apartment that if you’ve got anything in your background you have to do a little bit more to get the landlord to consider you,” Cervantes said. It wasn’t until Inside Out encouraged Molina to write a cover letter to her potential landlords explaining how she’s turned her life around that she was able to secure her current residence: a two-bedroom apartment on Broadway Street. She’s hoping to regain custody of two of her children, ages 12 and 13, who still live in Arizona. This weekend, for the first time in two years, Molina will fly back to Arizona to visit her kids and appear before a judge to make her case. Part of that case relies on her having enough space for the kids, Molina said. That’s why the smaller one-bedroom apartment she previously lived in wasn’t cutting it. In fact, when Molina moved to Iowa, leaving behind an abusive boyfriend who had her selling drugs, even her family thought she was abandoning her responsibilities. Since then, they’ve learned better. “A lot of my family really thought I came down here to get away so I could get high, but when they see what the Inside Out program has done for me — and I stuck by this program, I kept going to church, I got involved in my church — they were very proud of me,” Molina said. 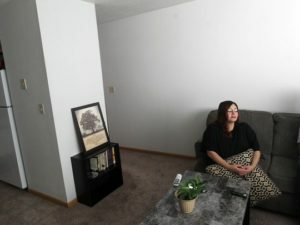 Finding housing after a prison sentence isn’t only challenging, it’s expensive, said Mark Sertterh, associate executive director at Shelter House in Iowa City. Sertterh said Shelter House often helps people who are homeless and have a criminal past find housing, and there have been times when they have gone through five or 10 rental applications before they can find a landlord willing to take a chance. With fees running around $20 to $35 per application, the costs add up. Iowa City’s work toward more affordable housing will help, said Heidi Cuda, regional director of Prelude Behavioral Services, which offers services to people who struggle with substance abuse in Iowa, Washington, Cedar and Johnson counties. But the stigma is still there, especially if someone has a substance abuse problem in their past, she said. “It’s hard to find housing because you have a criminal record. So there’s certainly a stigma. People just kind of don’t want to deal with them,” Cuda said. Finding a job can be another challenge for people leaving prison, but Caleb Wierman said he found it was best to be open and honest with employers about his past. When Wierman was 18 he moved to Iowa from Florida, but he grew restless and wanted to go back home. He stole cash and a truck to try to make the trip, but he was caught by authorities. After running away from his halfway house, Wierman was sent to jail for about 10 years. He was released from the Iowa Medical and Classification Center in Coralville in July. But all that’s behind him now, he said. After an interview at Neumiller Electric, Wierman said was offered a job on the spot. And although he was laid off about two weeks ago after a knee injury, he said his boss told him he’ll be rehired when he’s healthy. In the meantime, Wierman got another job at Family Dollar in Maquoketa, where he just moved with his girlfriend. Still, some employers won’t budge. Finding a job is especially hard for people who have multiple drug convictions or have served prison time, Cuda said. “The folks that have the biggest challenges are the ones who have felony convictions on their record. It makes it really difficult to get a job,” she said. That was the case for Miranda Lalla, an Iowa City resident convicted of vehicular manslaughter two years ago for a 2012 incident where she ran over a woman with her pickup truck while intoxicated. Lalla has now been sober for more than four years and attends Alcoholics Anonymous and Narcotics Anonymous meetings. When she got out of prison in January, she stayed in transitional housing offered by Prelude until she could find a job and place to live, but employer after employer ignored her applications or turned her down when they learned of her charge. “I only had one place that called me back for the interview, and that’s when she told me that she couldn’t hire me. But other than that nobody called me back,” Lalla said. Eventually, Lalla was able to get a job at the Hampton Inn in Iowa City. She bikes to work because she’s barred from driving for six years as a result of her conviction. While Lalla said she doesn’t mind biking, she said she would eventually like to get a driver’s license. Transportation is a common problem for people coming out of prison, Cervantes said. “Until I started working (at Inside Out) I didn’t realize how many people didn’t have a driver’s license. There’s a fair number of people who don’t, and that limits them in terms of the type of work they can do as well, besides getting to work,” he said. In the winter, Lalla will either have to catch a ride with one of her coworkers or wake up earlier before her 5:30 a.m. shift and walk the 45 minutes from her apartment to the hotel. No buses run along the route. Molina’s job at Goodwill is close enough that she can bike or walk to work. She doesn’t have a driver’s license either but said she wants to get one once she’s paid off a fine for driving without a license. Another common thread shared by many re-entering society after a prison sentence is the toll it takes on family life. The trip from Maquoketa to Dubuque, where his mother lives, is about 30 minutes, and he sees her almost every weekend. And, he said, his girlfriend has been very supportive. “She knows everything about me. She’s not judgmental at all. She’s very understanding and she knows I’m trying to do the right thing,” he said. Lalla has a 21-year-old son who still lives in the Iowa City area, but because of her drug use she hasn’t seen him in over 15 years. “That was on me because I kept choosing the drugs over him,” she said. While her son has said he’s not ready to see her yet, Lalla still sends him letters every month letting him know how she’s doing. She said she knows she caused her family to suffer during her multiple run-ins with the criminal justice system over the years. At the time, she didn’t believe she could do anything different. One month after opening Iowa City’s first Catholic Worker House, a three-bedroom house on Sycamore Street that will provide up to 30 days of shelter for those in need, David Goodner said the house already is full. Goodner, a live-in volunteer at the 1414 Sycamore Street house, at the beginning of the month officially opened the house with the help of fellow volunteer Emily Sinnwell. The two already are providing shelter to two recently-released prisoners and a single mother with two teenage sons. While the Catholic Worker House is new to Iowa City, it is not a new concept. In 1933, the Catholic Worker movement was founded by Dorothy Day in New York City. “Dorothy Day, during the height of the Great Depression, basically created a decentralized network of Catholic that, instead of relying on becoming a nonprofit organization, is a more decentralized volunteer-base network model,” Goodner said. Since its founding, the movement has spread internationally. This year, the The Phil Berrigan House — the Catholic Worker house in Des Moines where Goodner had lived and volunteered for six years and where Sinnwell had volunteered since high school — celebrates its 40th anniversary. The basic philosophy of the Catholic Worker is based on what are called the works of mercy, Goodner said, which include: house the homeless, feed the hungry, clothe the naked, heal the sick, visit the prisoner, speak truth to power and bear witness to injustice. “The idea is to ask: if Jesus was alive today, where would we find him? He would probably be with the single mother, or in the face of the homeless war veteran. If he was living in Iowa City today, that’s where you’d find Jesus,” Goodner said. Sinnwell, a nurse practitioner who is finishing a psychiatric fellowship at the Broadlawns Medical Center in Des Moines, splits her time between Iowa City and Des Moines. She said once renovations are done at the Iowa City house, the plan is to open the house on the weekends to allow the homeless or those in need a place to shower, eat, use the phone, get a haircut or simple medical help. “Our goal is to live simply and provide hospitality and be welcoming and let people know there’s a place they can come,” she said. Goodner said before the Iowa City Catholic Workers bought the house on July 1, they spent their time working with the city to see if the house could be opened. Goodner and other supporters began talking to local congregations to round up donations and volunteers. To date, he and Sinnwell have brought more than 250 volunteers and raised over $75,000. He said they also work with other area service agencies like Shelter House and the Salvation Army. The two prisoners who currently have shelter at the house come from the Inside-OUT Re-Entry Program. “Emily and I are really just bottom lining everything and organizing everything, but it’s much bigger than us. A lot of the people that are showing up are referrals from other agencies,” Goodner said. Donations were used to make a $40,000 down payment on the house. Future donations will be used to make renovations and cover costs as needed. “In addition to the money we’ve raised, we’ve also gotten furniture. Somebody gave us a piano, all the beds in the house, people have been bringing in food. We’ve already established a pretty substantial supply chain,” Goodner said. 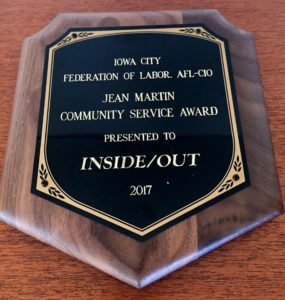 Lee Mickey, a parishioner at the St. Thomas More Catholic Church in Coralville, said she was happy to know the movement was coming to Iowa City and already has been working to help the cause. Mickey said she has contributed financially to the Catholic Worker house, but also has donated bedding, towels and rugs. “I thought it was very important that everybody has bedding or towels for showers. I feel like I’m just one person in many because a lot of my friends have said they are certainly ready to help out when the need arises,” Mickey said. “I feel lucky I’ve never had that sort of problem in my life, but I really appreciate that this is what Catholic Worker houses do; They fill a need for people who are homeless or who are in transition. Goodner said at this stage the house and his efforts are fairly small, but hopes to eventually buy more properties and open more Catholic Worker houses. He also hopes to eventually offer weekend meals, meal deliveries and a community potluck during which residents can cook food in the house and enjoy meals with guests. “We’re always raising our capacity and maturing as an institution and, especially with the size we are now in Iowa City, a lot of the things we try and introduce will be phased in,” Goodner said. Sinnwell said the house already has had to turn potential guests away. She said she and Goodner have been able to provide money for hotel stays for a few people who have approached them, but the fact that the Catholic Worker house already has more requests than it rooms illustrates the need. “There’s an obvious need in Iowa City whether we’re aware of it or not. Our goal isn’t to solve the housing crisis by any means, just to help people be aware of it and be active in helping fill in the gaps where we can,” she said. Rob Crader says growing up in violent Chicago neighborhood and being around “gang-banging and hustling” led to a career of drug abuse, and then selling drugs and committing robberies and thefts to support that addiction. Crader, now 42, of Coralville, who had been in and out of Illinois prisons for the last 10 years, now is on a new career and life path after his last crime — burglary — garnered him a 12-year prison sentence. While in prison, he went through drug treatment and started taking advantage of every educational, job training and rehabilitation program available. Crader learned that growing up around violence made him immune to it, and it was easier to be part of negative forces just to survive. Miranda Lalla, 54, of Iowa City, said she also had to change how she thought about others and herself. “I had to believe I was worthy of another chance,” Lalla said. Lalla, who has a long history of alcohol and drug abuse-related convictions, said her real-life change happened on June 17, 2012. She was giving a friend, Pamela Gross, 44, a ride home after they had been drinking at a bar, and they got into a physical fight in a parking lot. Lalla then got into her pickup truck to leave, but Gross was standing next to the open driver’s door and was knocked down by the door as Lalla put the truck in reverse. Lalla, without realizing Gross was still on the ground, continued to back up, running over and killing her. Lalla pleaded guilty to vehicular homicide and served over three years in jail and prison of the 25-year sentence. Lalla went into substance-abuse treatment while in prison and then into a halfway program. She also took advantage of the prison programs that teach inmates coping skills and how to stop negative patterns of behavior. Crader and Lalla said they faced many obstacles after getting out of prison, but they knew one of their biggest challenges would be finding jobs. They were passed over for several jobs because of their criminal records. Bills to “ban the box,” which would prevent employers from asking job seekers if they have a criminal record, have been proposed in the Iowa Legislature. According to the National Employment Law Project, based in New York, 19 states and 100 cities and counties as of earlier this year have passed ban-the-box laws. The U.S. Attorney’s Office in Cedar Rapids, along with Iowa Workforce Development and agencies and organizations last month sponsored workshops to encourage employers and human resource professionals in light of the shortage of workers to take a look at Iowa’s “untapped” workforce — ex-offenders such as Crader and Lalla. U.S. Attorney Kevin Techau told The Gazette last month these offenders eventually will get out of prison and return to the communities, so it’s beneficial if they can find jobs and housing and start contributing to the community in a positive way. “Employment is one of the largest indicators of whether an individual who has been released from prison will re-offend,” Techau said. During the three re-entry workshops — one each in Cedar Rapids, Ft. 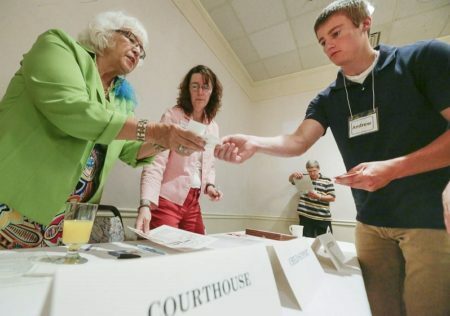 Dodge and Sioux City — the 60 to 90 participants all went through a simulation, which put them in the shoes of a fictional offender and they were required to comply with probation and parole requirements, obtain a job and avoid going back to prison. Many didn’t succeed and landed up back in “jail” which was a corner designated in the room that slowly filled over the hourlong exercise. Most of the employers at the workshop seemed open to hiring but were reluctant to comment for this article because they were undecided or perhaps, out of concerns about how their customers or clients might feel about these potential employees. 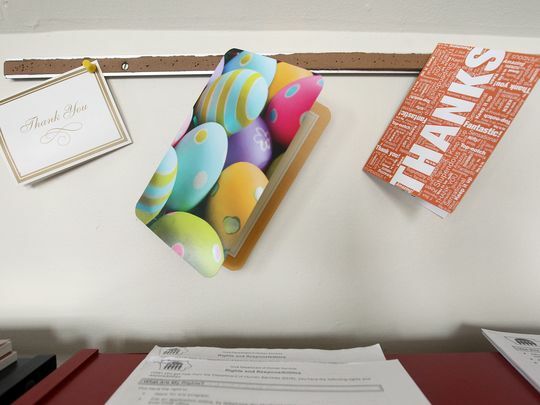 Employers are discovering these individuals who “overcome patterns of failure” are not only highly qualified employees but also demonstrate “remarkable” work ethic and loyalty, Horn added. Julie Little, a re-entry workforce adviser with Iowa Workforce Development who participated in the workshops’ panel discussions, works with employers on hiring workers with criminal records, and she encourages those companies to look at their skills and experience more than the crime they’ve committed. Little cited the Federal Interagency Re-entry Council in saying there is no greater risk for an employer to hire a person who has served prison time or has a criminal record than someone from the general public. The Council is comprised of 20 agencies, including the U.S. Department of Justice, that have been working for the past five years to reduce recidivism and to improve employment, education, housing and child welfare outcomes. The national recidivism rate is about 67 percent, but it’s much lower — only 31 percent — in Iowa. Little also pointed out employers can benefit from hiring ex-offenders because they can receive tax credits up to $2,400, depending on how many hours the employees work. And they may qualify for the federal bonding program, which lessens the risk for potential theft or dishonesty, if that’s a concern. The bonding program is free to the employer for the first six months, she added. Another important factor Little tells employers is that most inmates gain work skills and training while in prison, as did Crader and Lalla. Tim Diesburg, Iowa Department of Corrections Apprenticeship Program coordinator, talked with employers at the workshops about the recent apprentices offered in all nine prisons. The program, which started in 2014, offered only a few vocations. But today inmates can receive certification and training in 16 different industries including as a cook, cabinet maker, welder, computer operator, electrician, refrigeration and air-conditioning repair person, and electrostatic powder coating tech. Diesburg said there are 291 Iowa prison inmates in the program and 50 have completed their certification. Crader was granted early parole in 2014 but didn’t find a permanent job until three months ago in the maintenance department at the Sheraton Hotel in downtown Iowa City. He also obtained a scholarship and will start HVAC classes this fall at Kirkwood Community College. Lalla, who was paroled in January, didn’t find a stable job until nearly two months ago at the Hampton Inn in Iowa City. She handles the breakfast area and cleans the public areas of the hotel. She continues to attend Alcoholics Anonymous and Narcotics Anonymous meetings and hopes to be a mentor one day to other ex-prisoners. 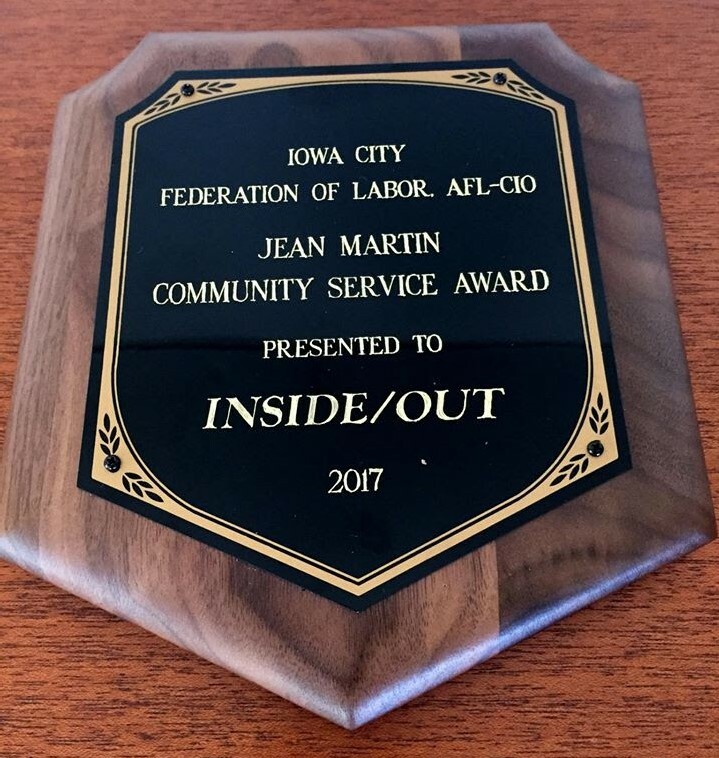 Both are involved in Inside Out, a not-for-profit in Iowa City that provides support and resources to individuals who come out of prison. Volunteers provide tutoring, mentoring, life skills classes and assistance with resumes, interviewing skills and housing. WHERE ARE THE POTENTIAL JOBS? The Workforce Needs Assessment survey is conducted annually by Iowa Workforce Development. Employers provide information regarding their current level of employment and their current and expected job vacancies. The regional analysis include Linn, Benton, Cedar, Iowa, Johnson, Jones and Washington counties. By the close of the survey, 1,305 of 5,741 employers contacted completed the survey. 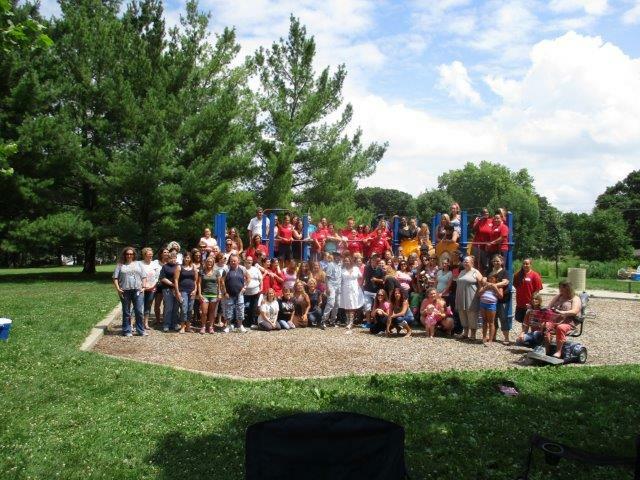 Amazing and wonderful visit to Winner’s Circle picnic on Saturday, July 30! 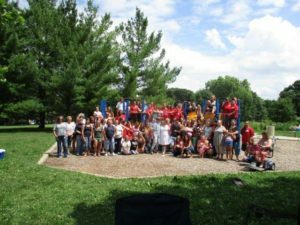 It was held at Ashby Park in Des Moines. Inside Out Reentry is grateful for the chance to attend. There was incredible spirit, positive energy, food and just lots of fun. This event is for women who have been thru the STAR and WISH programs at ICIW(Iowa Correctional Institution for Women located in Mitchellville) and their guests. Women from the minimum live-out unit attended as well as Winner’s Circles from around the state. It was great to see so many faces light up as Inside Out participants greeted friends and Mitchellville staff. Thanks so much to the ICIW counselors and reentry staff for allowing us to participate and being such welcoming hosts. 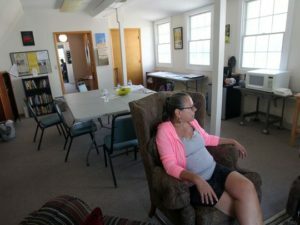 One year after opening its resource center at First Baptist Church in Iowa City, the Inside Out Reentry Community serving formerly incarcerated people living in Johnson County is gaining ground. Inside Out hired its first paid director, Mike Cervantes, in January and secured legal 501(c)3 nonprofit status last month. It is serving 15 participants at present, has a core volunteer support group of 30 and its drop-in resource center bustles with positive activity. Help comes in the form of assistance with education, job and housing applications, and problem-solving, plus tutoring, mentoring and regular community meetings and workshops on life skills a “returning citizen” needs to succeed. Cervantes tells me “returning citizen” is the preferred term for a person who has served their time in prison, has been released on parole and wants to maintain a productive life. Their barriers are many, from lack of family and financial support to employer attitudes and public perceptions. Robert Crader joins us in the conference room and offers input on this topic from the standpoint of an Inside Out participant. Crader can speak from experience. He grew up in a drug- and crime-infested neighborhood in Chicago, served time in prison, then joined his mother in Iowa City about a year ago. He says Inside Out is one of two major factors in turning his life around. The second factor, according to Crader, was physically removing himself from his Chicago neighborhood. He was able to come to Iowa City by getting his parole transferred from Illinois to the Iowa Sixth Judicial District. That leads Cervantes to talk about “the tribe” instinct in people, regardless of who they are. Volunteers are the key to providing an accepting environment for the participants, he says. Alicia Velez is a volunteer mentor in the program and the wife of Robert. She describes meeting with a female mentee during the past year — twice a week at first, then once a month. She says the experience was beneficial to them both. Cervantes is a Wisconsin native who has been a high school teacher in alternative schools in Cedar Rapids and social activist for most of his working career. He later connected with Pastor Dorothy Whiston of First Baptist Church, which founded Inside Out in collaboration with New Creations International Church and The Dream Center. As a volunteer at the Oakdale correctional facility in Coralville, Cervantes says a future goal is to work to make college level courses available in Iowa prisons. For more information, contact Cervantes at insideoutreentry@gmail.com. Inside Out will continue our community discussions on Criminal Justice Reform with a DVD series — beginning this Thursday, Oct. 29 at 7:00 at First Baptist (500 N. Clinton; in the basement community room). We’ll watch the 2009 PBS documentary “The Released” that shows how several returning citizens with mental illness handle their return to the community after incarceration. About 1/3 of people in U.S. prisons have a serious, chronic mental illness. We’ve had 2 great discussions on the first half of Bryan Stevenson’s book Just Mercy so far and will have 2 more meetings to discuss the last half — on Thursdays, Sept. 24 and Oct. 1, at 7:00 p.m. We meet in the basement of First Baptist Church, 500 N. Clinton, where the IO center is located upstairs. We hear from folks who have been on the “inside”, discuss local and national issues of racial disparity in the justice system, and more. Join us for this important conversation! We’ll also host a discussion — with pizza! — one half-hour following the end of Stevenson’s talk at IMU on Oct. 4.